Envirotech is a leading Fabric Wrapped Acoustic Panels, Fabric Cover Acoustical Wall Tiles Manufacturer in a Variety of Colors, Designs & Sizes to absorb sound & echo. Envirotech Fabric wrapped Acoustic Panles” or wall panels are fabric laminated acoustical wall panels that provide excellent sound and noise control where it’s needed the most.Intentionally engineered to offer pleasing design along with unmatched acoustic benefits, with uncompromised aesthetics. 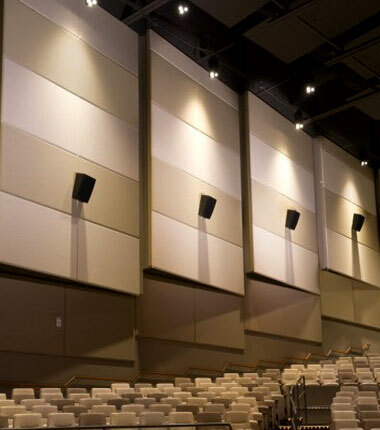 The wall panels provide exceptional acoustic performance NRC1.0 tested for normal incidence sound absorption coefficient as per ASTM E 1050 / ISO 10534-2. These tiles are lightweight and can be fix directly on walls, easy to integrate with existing design plans. The wall panels are Impact resistant and rigid; the panels are designed to resist reactivity to seasonal changes in temperature or humidity, making them ideal for use in any interior space. Envirotech Fabric Cover acoustic Wall Panels” wall panels are available in different size and colors to match with interior OR in different color shades to make wall multi color patterns and intended to pair seamlessly with your existing or planned designs.These panels are an efficient, durable, cost –effective solution for reducing excessive reverberation in large spaces. Envirotech System is Leading manufacturer of these beautiful handmade fabric wrapped acoustic panels are available in various standard colors with unlimited options for custom designer fabrics. envirotech custom makes these in any size and number along with any shape detail to your home theater needs. If you are looking for an easy way to finish your home theater these can be hang like pictures with adhesive to make permanent fix.